Our annual banquet in February was a massive success. This year again featured mouse races, and the event was attended by over 200 guests. The record attendance and success of the evening are due to the tireless work of our banquet committee and wouldn’t have been possible without the contributions from so many in our community. The Freeburg Chamber of Commerce would like t thank our donors Country Mart, Ace Hardware, Freeburg Pharmacy, Exchange Cart, Freeburg Liquor, Mathis Marfin Richter Law Firm, Pat Cook, Citizens Community Bank, Freeburg Care Center, Brad and Kim Towers, Rural Family Medicine, Jack’s Car Wash, Jerry Costello, Seth and Elaine Speiser Construction, Total Fitness, Renner Funeral Home, Freeburg Rotary, Edward Jones – Clay Mason, Niebruegge Insurance, Domin’s, Asset 1 Real Estate, Regions Bank, Jerry’s Auto Body, Freeburg Towing, Cedar Trails, Reifschnieder’s, Pizza Hut, Freeburg Animal Hospital, Casey’s General Store, Computype, Trenton’s, Freeburg Vision, Grey Eagle Distributing, Fritz Distributor, Sam’s Club, and ATI. Check out these other upcoming Chamber events. The next regular meeting of the Freeburg Chamber of Commerce is Monday, April 8 at 7pm at the Freeburg Library. This meeting will feature important discussion regarding the Chamber Constitution and a proposed building facade grant program. A ribbon cutting event is scheduled at the newly opened Rosie’s Gaming Lounge at 302 S. State Street in Freeburg at 5pm. Please help us welcome Rosie’s to the community. From a new business to a long-time pillar of the community, the Freeburg Care Center has an open house on April 11 to celebrate their 40th anniversary. Please join us as we celebrate Freeburg Care Center! Joining the Freeburg Chamber of Commerce allows members exclusive networking opportunities like our quarterly business luncheons. Our next luncheon is scheduled for April 18 at 11am at The Weingarten. The guest speaker will be Representative Mike Bost. Follow us on Facebook and Twitter to stay up to date on our activities. The Freeburg Chamber of Commerce is considering hosting an electric Christmas parade The concept being discussed would see a parade covered in Christmas lights that would lead to the Freeburg Village Square park. This parade would coincide with the Village of Freeburg’s Annual Lights in the Park event in December. If you would be interested in joining this event or attending it, please let us know on Facebook or Twitter. We would love feedback and we are attempting to gauge community interest. Don’t miss these upcoming events. 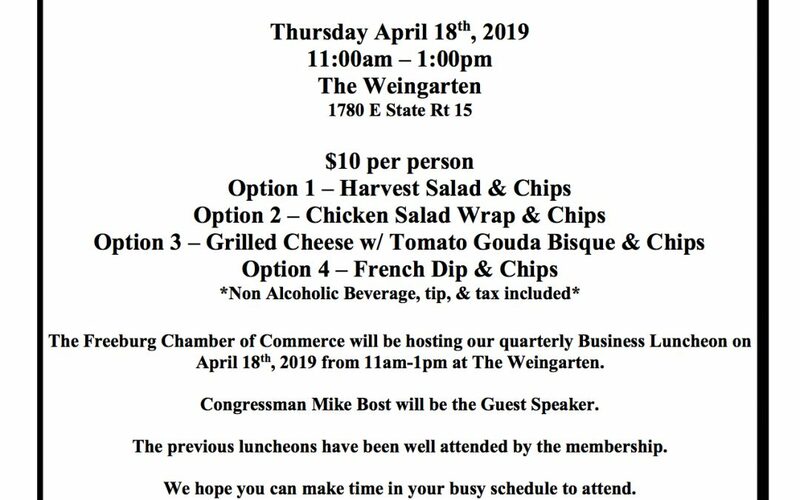 The Freeburg Chamber of Commerce will hold our quarterly business luncheon on Thursday, April 18 at The Weingarten. The luncheon will be from 11 am – 1 pm with a $10 lunch. Guests will have the option of a harvest salad and chips, chicken salad wrap and chips, grilled cheese with tomato gouda bisque and chips, or a French dip and chips. A non-alcoholic drink, top, and tax are included. The guest speaker will be US Congressman Mike Bost. 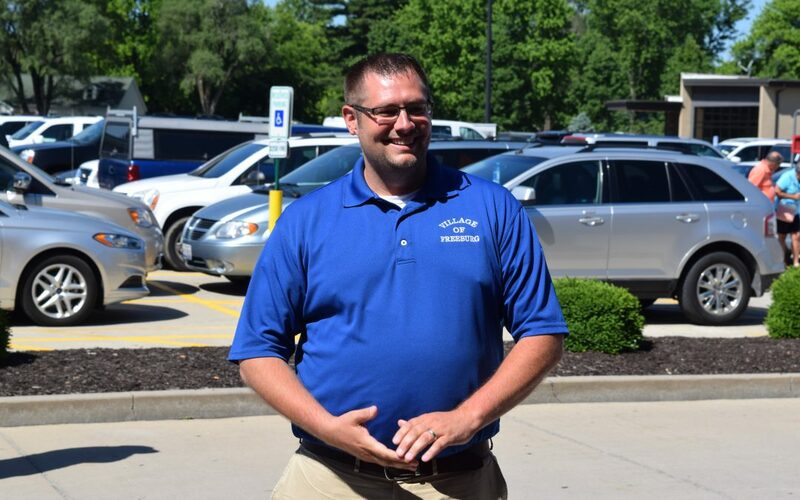 Freeburg Chamber luncheons feature a keynote guest speaker, an update on Chamber activities, and a unique networking opportunity in a relaxed environment. Please RSVP to Matt Trout at 618-410-8077 or email at mtrout@freeburg.com ASAP if you wish to attend. The luncheon has limited space and is open to the first 35 people who RSVP. If you are not a member but wish to attend the event, come see what the Freeburg Chamber can do for your business. You can join the Freeburg Chamber of Commerce by filling out our membership application. We are working to book more frequent luncheon events in the future, so make sure to follow us on Facebook and Twitter to stay up to date on Chamber events. I want to take some time to say Thank You to the Freeburg Chamber of Commerce and its members for allowing me to serve on the Board of Directors for 3 Years and as the President for the past 2 years. It is my hope that during my time serving as President, that I was able to leave the community a better place for everyone. I take great pride in the things that we were able to accomplish during my tenure. This group has taken many steps to keep up with the ever-changing business trends and strives towards supporting the businesses in our town. The addition of the Business Luncheons has been a great success and heavily supported by those in the community. The Luncheons help us reach out to our business leaders and encourage open and honest discussion. I hope to see this event and other events continue. We have also successfully launched a new website and generated a strong social media presence, allowing us the opportunity to communicate more efficiently about our events as well as topics that affect the community at large. The change in bylaws regarding meeting time has allowed the The Board of Directors as well as the Chamber body, to work with a more flexible meeting schedule to accommodate all members. The overwhelming success of the The Fall Festival and Chili Cookoff cannot be denied. This event has become a “can’t miss” activity for families as well as business owners. 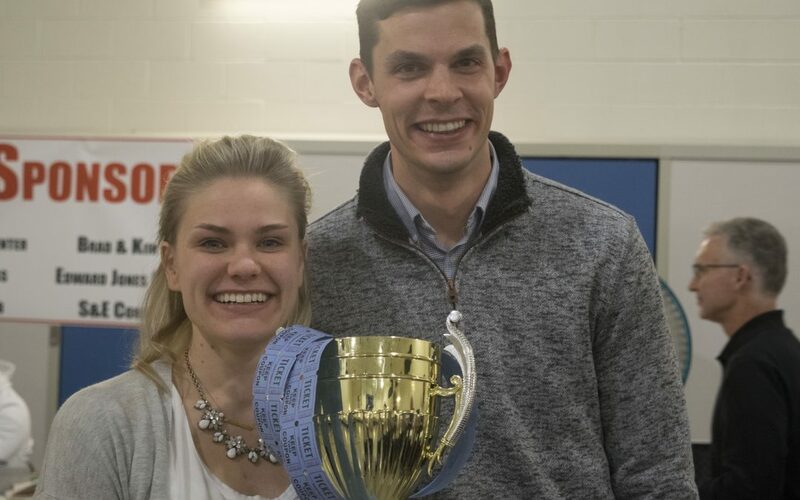 In addition to providing a great community event, roughly $23,500 of proceeds have been donated to the Freeburg Food & Clothing Bank and the Freeburg Utility Assistance Fund. 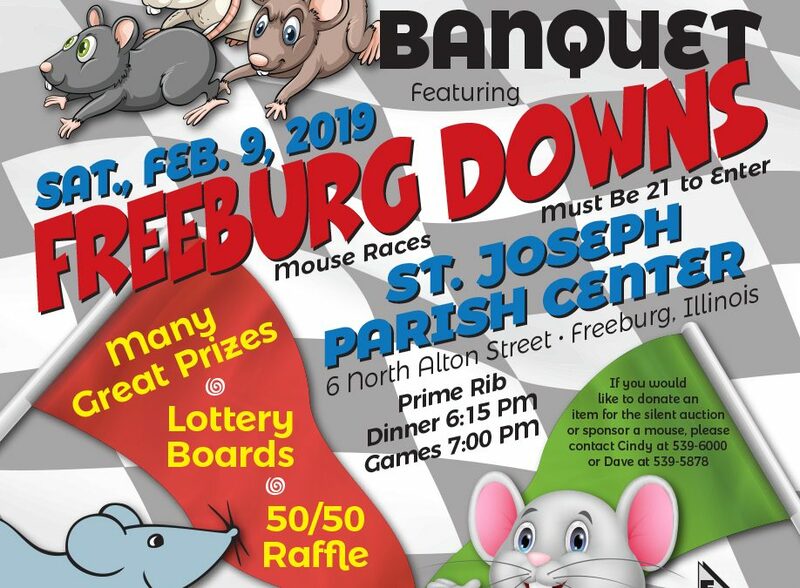 There’s nothing better than seeing the citizens of Freeburg coming together for a fun time, a great cause and seeing the proceeds going directly back into the town. My hope as I step down is that the progress, we have made in the past several years continues to move forward so that we see even more community involvement, support of business development and the overall improvement of the town. Thank you so much for allowing me to serve the Freeburg Chamber of Commerce and please feel free to reach out if I can ever be of help. Yesterday, Black Friday, kicked off the holiday shopping season with major retailers offering door buster deals. While the mad dashes and fistfights in line aren’t as prevalent as in years past, Black Friday is still a major shopping day. So is Cyber Monday, when the doorbuster move online. Nestled between these days is Small Business Saturday. Small Business Saturday is a day designed to remind you to shop local, and shop small. Instead of giving all of your business to big box retailers on Black Friday or online megastores on Cyber Monday, give small business a chance and shop local. In our community, many fantastic businesses owned by, operated by, and employing your friends and neighbors depend on your support. 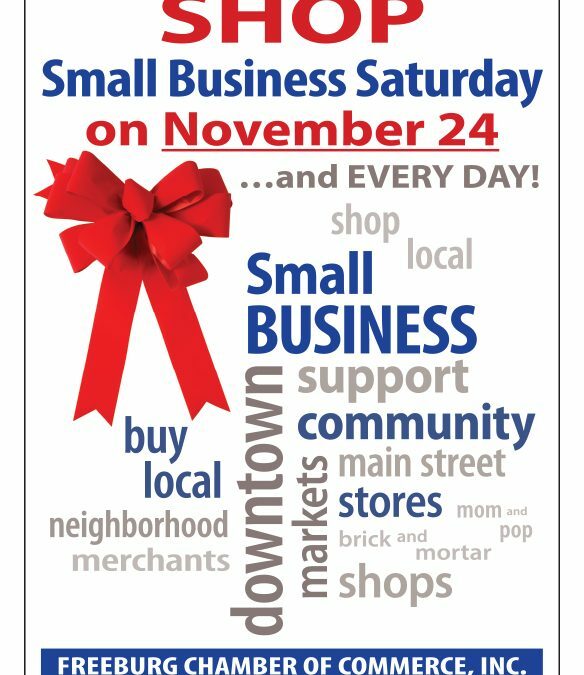 Please see what our community has to offer and shop local this Small Business Saturday, and throughout the entire shopping season. According to the SBA, 47.5% of the private workforce in the United States comes from 27.9 million small businesses. Make no mistake, this is no act of charity. Our community is full of excellent businesses that provide quality and value. To find a local business that fits your needs, check our directory. You can search by industry and find a local solution to your needs. Make sure to follow the Freeburg Chamber of Commerce on Facebook and LinkedIn for more updates and information on our member businesses. If you are not a member and would like to be listed in the Freeburg Chamber directory, you can become a member here. 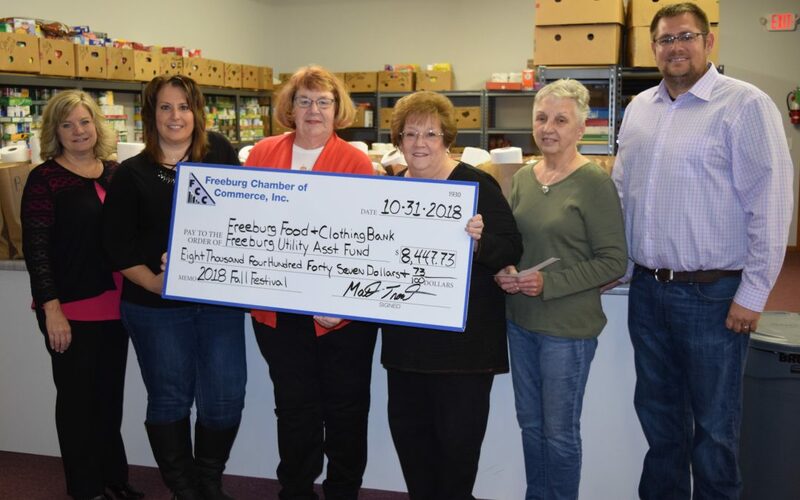 The Freeburg Chamber of Commerce recently donated the profits of our Chili Cook Off and Fall Festival in September to two worthy local charities. The profits were evenly split between the Freeburg Food and Clothing Bank and the Utility Assistance Fund. The Food and Clothing Bank is run by St. Paul’s United Church of Christ. The bank recently moved into a larger building 1050 N State Street. The Food and Clothing Bank helps between 30-40 families each month with food and clothing donations collected from around the Freeburg community. The bank is open the first and second Tuesday of each month from 2pm to 4pm and the third Thursday from 5pm to 7pm. To contact the Food and Clohting Bank or donate, call 618.539.5070 for more information. The Utility Assistance Fund is also a charitable wing of St. Paul’s. They help those in need in the community struggling to pay their utility bills. Both the Food and Clothing Bank and the Utility Assistance Fund received $4,223.50 donations, equal half shares of our profits from the Chili Cook Off. In addition to these donations, the Food and Clothing Bank also held a food drive at the Chili Cook Off. Other local organizations also participated in the event. We are thrilled the Fall Festival was able to help these worthy causes. Thank you to everyone who helped make this year’s Chili Cook Off and Fall Festival a major success. Thank you to everyone who came out and ate chili, supported their local organizations, and ultimately helped us raise these funds to help those in need. 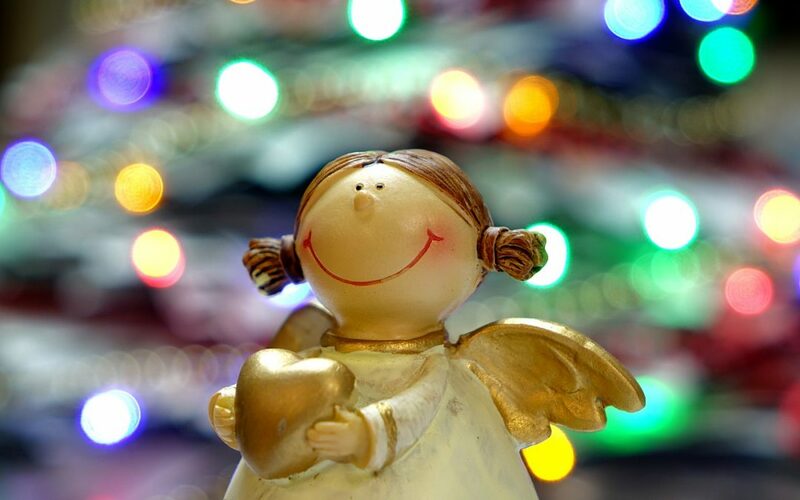 As the holiday season approaches, we highly encourage you support these organizations and the other not-for-profit groups in our area who help the needy. As you plan your charitable donations for this season, please keep them in mind. To get regular updates on next year’s Chili Cook Off and Fall Festival, like the Cook Off on Facebook and like the Freeburg Chamber of Commerce on Facebook. Just as a reminder, Chamber members are allowed free entry into the Cook Off, so consider that when weighing your decision to become a member. 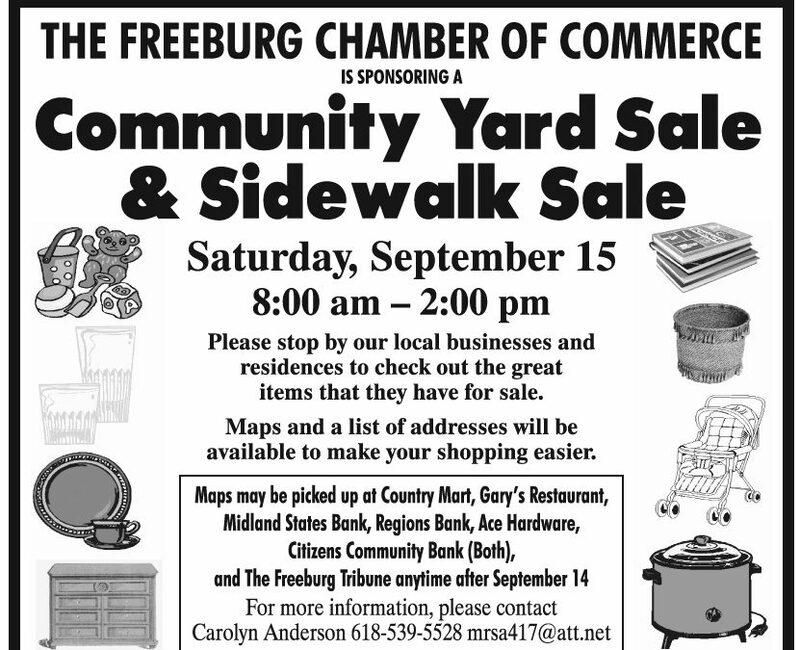 The Freeburg Community Yard Sale is coming up next Saturday, September 15 from 8 am to 2 pm. The Freeburg community will be jammed head to toe with individual sales. Stop by and find hidden treasures, and give some items a much needed new home. The Chamber will have yard sale maps available at local businesses on September 14 to make your shopping experience easier. If you plan on selling, sign up before September 10 to be included on the map. The maps will include the address and a brief listing of sale items. Maps will be available for pickup at Country Mart, Gary’s Restaurant, Midland States Bank, Regions Bank, Ace Hardware, both Citizens Community Bank locations, and The Freeburg Tribune September 14 and 15. If you live on the outskirts of Freeburg and want to participate, spaces are available in the Freeburg Marketplace for you to sell your items. Country Mart will also be having a Fall Fest with events and attractions in the parking lot of the market place. To participate in the yard sale as a seller, or for more information, contact Carolyn Anderson at 618-539-5528 or mrsa417@att.net. Make sure and get signed up by September 10 to be on the map. If you’re looking for deals, or to discover hidden treasures, come check out the sales around Freeburg. While you’re here, please try the many great businesses in our community and enjoy the best that Freeburg has to offer! 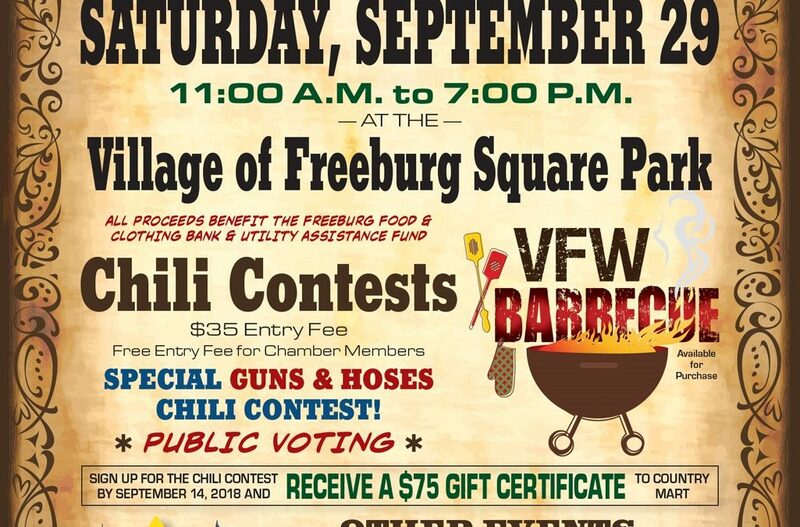 The Freeburg Chamber is preparing for the annual Chili Cook Off and Fall Festival to be held on Saturday, September 29 at the Village Square Park in Freeburg. Last year’s event was a big hit and we’re looking forward to another fun and tasty day at the park! The festival will be from 11 am to 7 pm. All proceeds from the event will be donated to the Freeburg Food and Clothing Bank and the Utility Assistance Fund. The main event is the chili cook off. The winning team receives a $500 prize, and all teams that sign up before September 14 get a $75 gift card to Country Mart in Freeburg. The entry fee is $35, but Chamber members can enter for free. This is one of many benefits extended to our members, like exclusive networking events. The public will vote on a winner. Attendees can buy a round of samples from all of the stands, and will get a chance to vote on their favorite chili. There will also be a special guns and hoses competition between the police and fire departments, with separate voting. If chili isn’t enough for your stomach, the VFW will also be selling BBQ. 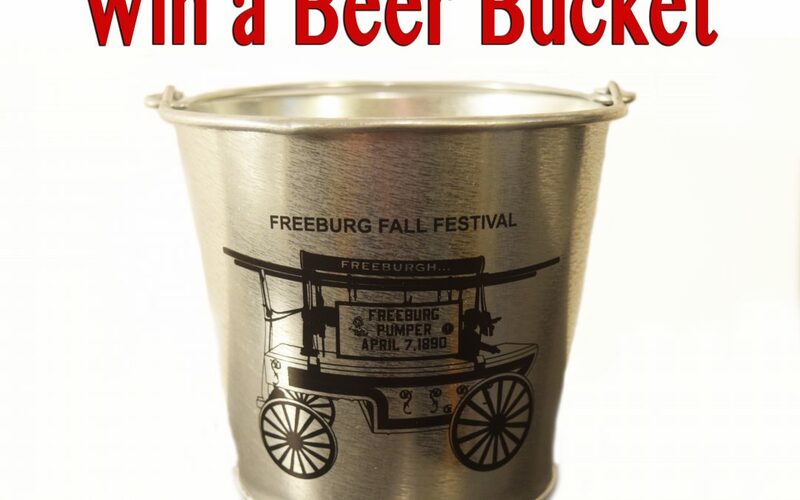 Old fashioned beer buckets will be for sale that can be refilled throughout the event for a reduced price. The buckets are not only a great value for the beer itself, and handy to carry around the event, but they make for great collectibles and display pieces. There will be plenty of activities for young ones, including a large kids activity area sponsored by Hope Christian Church. The Freeburg Women’s Community Club will be having pumpkin and face painting as well. The Freeburg Food and Clothing Bank will be holding a food drive, and everyone who brings food items will be entered into a basket raffle. If you’re looking for an opportunity to get your business some positive exposure in front of a great crowd from around the area, we have event sponsorship opportunities available. Sponsorship information, as well as the entry form for interested teams, are attached below. For more information, email mtrout@freeburg.com or call 618-410-8077.